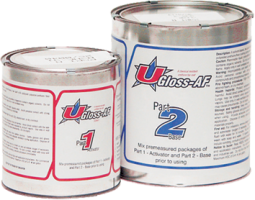 UGloss-AF® Clear can be used whenever a “transparent” top coat is needed to seal and allow floor graphics, safety stripping or decorative aggregates to show through to the surface. Typical Coverage 400-576 sq. ft. Kit includes one (1) coat of UGloss-AF urethane top coat (choice of color), applicator tools, mixing pail and instructions. Add $60 for Safety Colors. Typical Coverage 400-576 sq. ft. Includes UUGloss-AF urethane top coat material only. Add $55 for Safety Colors. Typical Coverage 200-288 sq. 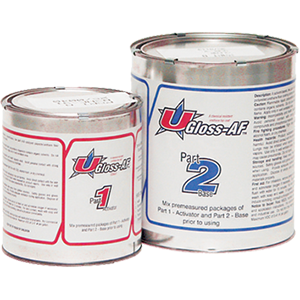 ft. Includes UGloss-AF urethane top coat material only. Add $55 for Safety Colors.